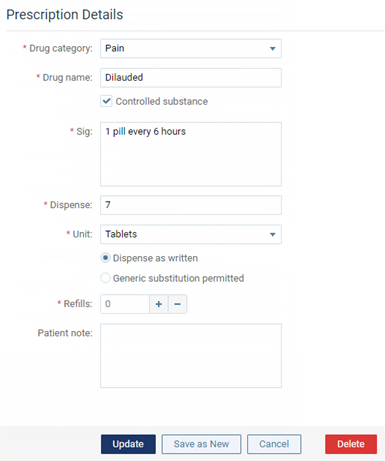 You can create prescriptions templates to make entering prescriptions more efficient. Create templates for the most common drugs and amounts you prescribe. Note: Prescription templates are global (available to all locations across your organization). Create new - To make an all new prescription template, click (or tap) Add New Prescription. Base on existing - To make a prescription template based on an existing template, select the template that is similar to the one that you want to create. 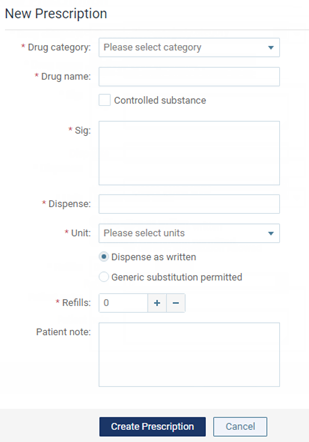 The options for adding or editing the prescription template become available. The options that are available depend on whether you are creating a new template or making one that is based on an existing template. Enter or modify the prescription details, such as the category, name, and dosing instructions. For an all new template, click (or tap) Create Prescription. For a template based on another, click (or tap) Save as New.